Stereo color line scan camera based on allPIXA. 3D height map and color image simultaneously. Optical resolution up to 5 micron. Height resolution up to 1 micron. 3D height map in real time using graphic boards. The Chromasens 3DPIXA camera is based on the stereo principle, whereas two images are captured from the same object. Height data is calculated from these two images in real time with advanced pattern matching algorithms running on GPUs. This innovative merging of line scan technology and ultra-fast 3D stereo algorithms opens up the potential for new machine vision applications that demand precise and fast 2D and 3D measurements. 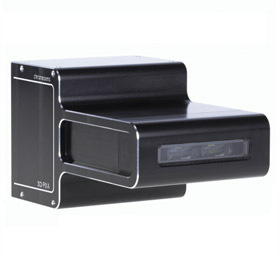 The 3DPIXA stereo camera simultaneously provides color images alongside either the height map or 3D point cloud.